For those not to familiar with WaterField bags, don’t worry, they aren’t advertised anywhere, they aren’t sold locally, and actually you wouldn’t even know they existed unless you were looking for a carrying bag or sleeve. I will tell you this though, there’s nothing like a company that offers the consumer the ability to customize the product they want. Wait what? I can get a sleeve in a vertical or horizontal format? I can get a laptop bag with or without a shoulder strap? These are just a few options that make WaterField Designs quite unique in its own way and honestly that makes for a successful company. Plus it's a company based out of San Francisco so you know we are going to show them some love. They were kind enough to send out their Outback Sleeve for the Retina MacBook Pro and we have been testing it out for a few weeks. Come on in and join the picture viewing party to see if this sleeve deserves your precious laptops protection. So you just got a base or custom built shiny new rMBP like me? You must be exhilarated like myself to be using such an outstanding computing machine. I tend to bring my laptop with me everywhere but I found there isn’t too many cases or sleeves actually made for the Retina computers. Most manufacturers have sleeves made for the Classic MBP and are advertising they “fit” the Retina laptops as well. Well that might be true, but it’s not a precise fit due to the smaller footprint. Also, these companies will tell you to buy the MacBook Air version sleeve because it will fit. What? I bought a rMBP not a MBA. Well it’s reassuring to know that WaterField actually makes sleeves custom to fit the rMBP line of computers. The Outback sleeve we reviewed comes in all the MBP/MBA sizes, both vertical/horizontal orientations, and the trim leather design comes in chocolate or grizzly colors. If you take a look at the website, it’s quite staggering to see all the choices and styles you can achieve throughout their line of products. The vintage, ageless look of the sleeve gave my initial impression a satisfying feeling. The waxed canvas material of the sleeve felt great in the hand, very sturdy and didn’t feel bulky at all. The Outback has a very sophisticated look to it and I felt very comfortable pulling it out of my bag at meetings these past few weeks. I’m not going to mention other product names, but we all know there are some awfully cheap sleeves out there for our pricey laptops. 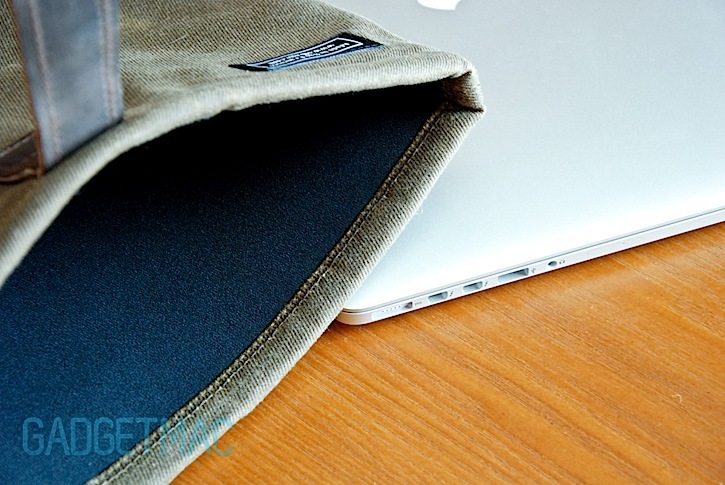 Even if you did find a sleeve at your local store, odds are it wasn’t made for your Retina laptop. This Outback sleeve was a nice change of pace compared to other sleeves and I was hoping my first impression will last throughout the review. Sounds simple, but the stitching alone is worth mentioning. As you can see from the pictures, the craftsmanship that went into the design and the actual assembly process of the sleeve is superior to anything I’ve reviewed. Not a stitch was out of place or any fringes found around the sleeve. Another nice touch to the sleeve is the bottom leather trim. It’s a simple touch, but completes the look of the sleeve. Both leather choices available compliment the canvas material and you couldn't choose a wrong color. As you can see, the front of the Outback sleeve features a matching leather strap that snaps your rMBP closed inside the sleeve. It was nice to review a quality sleeve that doesn’t use metal zippers to keep close the sleeve. I’ve personally seen hairline scratches on aluminum cMBPs that were caused by zippers on sleeves. Cough cough Incase. 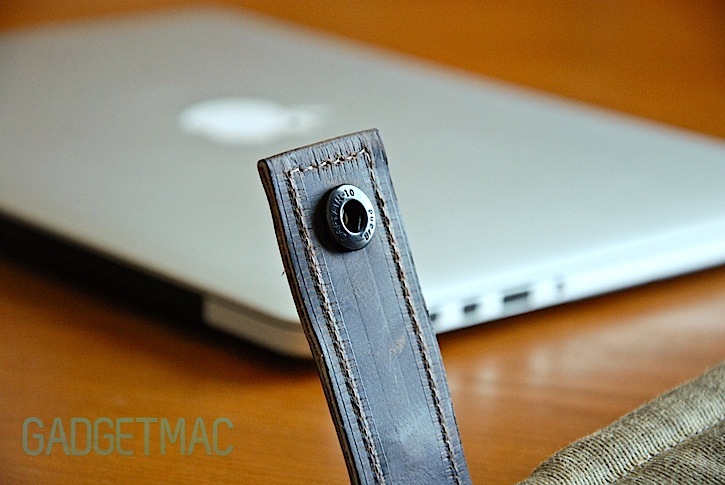 The top of the sleeve is stitched together to make a long rectangular format to give the rMBP the perfect fit. After a few weeks of using the sleeve, there was no sign of damage involving the stitching and the snap functioned like it did on day one of the review. Well the outside of the case is a winner, but what about the inside? It also screams quality with a heavy dosage of neoprene. The stitching along the inside has some very clean lines and is simply precise. I was happy to see a very small company logo on the backside of the sleeve. Most companies love to slap their name on the front and honestly makes for some hideous designs. Two nice features that are worth mentioning to our viewers. Even though I keep raving about the quality of the sleeve, the main question for me was how would it function in everyday tasks. For example, I would use my laptop at home, work, poolside (sorry cold weather people), wherever needed. The sleeve was effortless to use and I was able to snap open the sleeve, slip the laptop in, and close it without thinking about damaging my laptop. The laptop sits inside the sleeve a little recessed and fits super snug. Even with the firm closure, the laptop was a breeze to take in and out. Knowing the quality of neoprene used, and knowing there was no metal to scratch the laptop, I always felt comfortable carrying the sleeve around in a bag or by itself. The ageless canvas material used for the sleeve can be used in many fashion settings. I had no problems throwing the sleeve in my professional work bag, throwing it in a colorful backpack, or just carrying it by itself. It looked first-class when paired with a brown suit and colored tie, but as you can see, it looks magnificent with a t-shirt and jeans. For the few weeks that I used and abused this sleeve I was far pressed to find any negatives. The material, especially the leather was superior, the attention to detail was impeccable, and it goes well with any outfit you happen to throw together. I unfortunately didn’t have the opportunity to hit the airport with this little guy, but according to the WaterField website the sleeve is TSA friendly and you wouldn't have to take the laptop out. Coming in at under $50 the price is just right and a no-brainer kind of purchase. If your spending well over 1k for a laptop you might as well spend the few extra dollars on a quality sleeve. I also recommend you taking a look at the WaterField website. The bags and case choices are spectacular plus the customization of these bags are endless.